The Council commissioned a local firm of Consulting Engineers to carry this out. It involved removing the plaque, which has a raised impression of Wilkinson’s head on it. The space revealed was big enough for the engineer to crawl inside the monument itself, and, with the aid of some ingenious ladders and planks, to take a good look at what has been hidden for over 20 years. When we got the report it included some fascinating photographs. Happily it does not indicate any serious defects, but it does advise some remedial and maintenance work to the interior of the monument as part of any refurbishment programme. There is some rusting and pitting and we were surprised to learn that the monument is not actually fastened down, but rests on its own weight. We all agree that it would be unwise to proceed with external works without attention to the interior and indeed it is likely that Health and Safety could be compromised were we to ignore its recommendations. Born (legend has it) in the back of a farm cart in 1728, John Wilkinson worked in his father’s foundries at Skinner Hill and Wilson House in Lindale and at Backbarrow before moving to the West Midlands where he developed his own foundry businesses. Here he invented many new ways of working with and using iron, patenting an extremely accurate method of boring cannon barrels and helping James Watt perfect the steam engine. He introduced his own coinage with his profile and championed the use of cast iron far and wide. This included the world’s first iron bridge, designed by Telford, crossing the River Severn at Ironbridge (now a World Heritage Site;) the first cast iron framed buildings; a cast iron boat and even cast iron church pulpits. Abroad, his company supplied over 40 miles of iron pipes to carry water from the River Seine to Paris. Lindale always remained special to him and he built Castle Head as his main home and headquarters. With both a wife and mistress his personal life caused something of a stir among the locals and his eccentricity is evident in the arrangements he made at Castle Head for his own death. He laid a cast iron coffin in the garden ready for his day of reckoning, constructed the obelisk to stand above it, and composed his own epitaph. 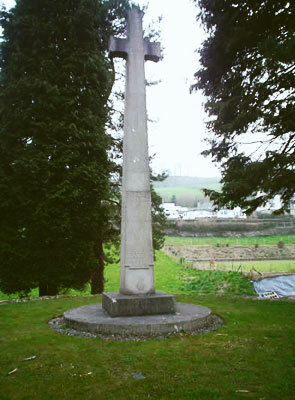 Wilkinson died in 1808 and was laid to rest as he had wished at Castle Head. 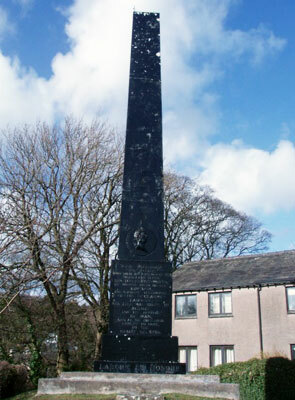 However the house passed into new ownership and the occupiers were less than happy to live with the perpetual reminder that the original owner was buried in their garden and so his body was removed to Lindale Parish Church in 1828 although its exact whereabouts remains a mystery to this day. The obelisk was unceremoniously hidden amongst the undergrowth until it was eventually re-erected on its present site in 1863. 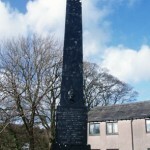 By the 1980s the monument, which had been neglected for many years, was in poor shape. 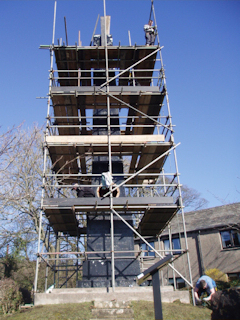 The Parish Council of the day succeeded in raising sufficient funds to have extensive restoration work carried out and this was completed in 1984. 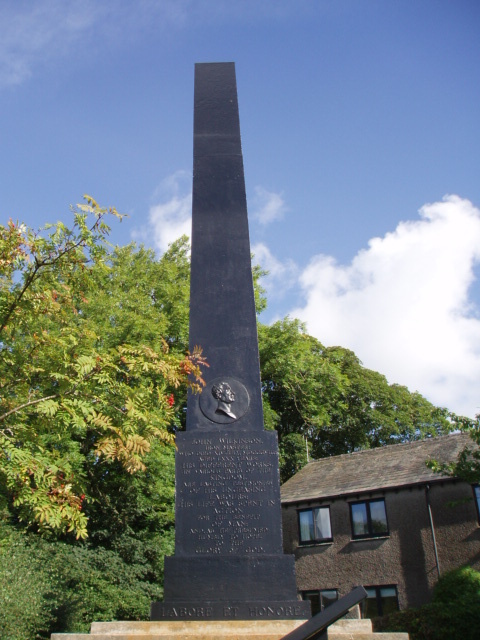 2008 marked the 200th anniversary of the death of John Wilkinson and to coincide with this the Parish Council decided that the monument should be repainted. 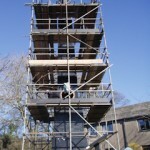 A full professional examination of both the interior and exterior revealed that some remedial work would be needed in order to ensure the structure’s long-term future. 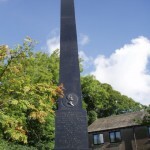 Commemorative and fundraising events were held in 2008 and an information panel was installed at the monument site as part of the anniversary celebrations. By means of donations from the local community and with the assistance of major contributions from the Taylor Newton and Hibbert Trust, English Heritage, Cumbria County and District Councils and the Worshipful Company of Ironmongers, the necessary funds were raised and complete renovation works were carried out under the guidance of Burgess Roughton (Consulting Engineers,) Metalock Engineering and Ian Parker (Mill Side.) The work was finally completed in May 2011. 9.00am – 5.00pm Monday – Friday.